Single crystals of pure glycine phosphite (pure-GPI) and sodium hydroxide added glycine phosphite (NaOH-GPI) were grown by slow evaporation method and Sankaranarayanan and Ramasamy method (SR method). 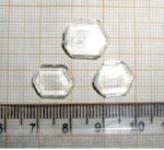 The transparent, colourless NaOH-GPI crystal with cylindrical shape about 13 mm diameter and 25 mm length was obtained by SR method. The crystalline quality and lattice parameters have been analyzed by single crystal, powder X-ray diffraction and High resolution X-ray diffraction (HRXRD) for both the samples. The functional groups and the optical property were analyzed by the Fourier Transform Infrared Spectroscopy (FTIR) and UV-visible spectrum respectively. The curie temperature of pure GPI and NaOH-GPI was obtained from the dielectric studies. The NaOH-GPI shows low curie temperature value comparing with pure GPI. The results are discussed in detail.